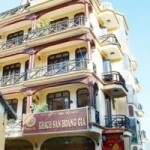 This page is about Sapa View Hotel in Sapa Town, Lao Cai Province, Vietnam. 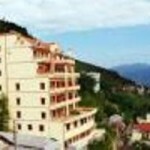 You can find here some Sapa View Hotel introduction, about the owner of Sapa View, hotel types of rooms, the restaurants inside the Sapa View and much more. Settled down in Sapa over 20 years when tourism was new to everyone here, the owner fell in love with the beauty and local culture here as well as knowing how the passion has flowed within the heart of travellers to this destination. With working experience in construction and architecture, the owner brought in his love for the destination to build up Sapa View hotel which opened in 2010. His aim is to bring you the very truly Sapa experience. The owner spent several months, with great deal of efforts, searching in all over remote villages for the best timbers, stones, the best carpenters to build the Sapa View hotel. Details are taken care, with flowers and trees in the entrance, the oriental Fengshui balance, corridors and staircases of Sapa architect style. 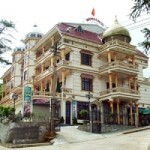 Especially, the 30 rooms provide the special balance of luxurious amenities and the local architecture: the old styled fireplaces, floor made of perfume timbers, window that catch the sunrise and looking the Violet valley and Fansipan mount, the balcony with Sapa local flowers… All will bring you inner balance and health. The hotel restaurant and bar are also special. The timber architecture and local ethnic cloths are used for décor that is to bring you closer to the local community. They signed up a strategic partnership with Hoa Sua Hospitality School for Orphan children in order to bring you the best chef who could serve you the best meals from our local ingredients. They have live local music at the restaurant. Come for dinner and enjoy our live performance brought to you by local artists with their love songs and Hmong Khèn. 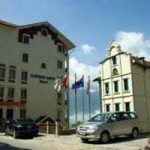 Sapa View is a live Sapa museum, where you can feel like you deeply “dissolve” into our rich local culture. If you have time for a trek into the local villages, our local guides – who come from these villages – are more than happy to take you to their homelands. Only 0.5 km from the city center, Sapa View Hotel’s strategic location ensures that guests can quickly and easily reach many local points of interest. For sightseeing options and local attractions, one need not look far as the hotel enjoys close proximity to Thac Bac Silver Waterfall, Mau Temple, Bus Station. These rooms are large, spacious with spectacular view over Fansipan mount and Muong Hoa valley. Offering a warm ambience, characteristic of the tranquil Sapa nature. Style and spacious elegance define our Sapa View Room, tailor made to capture the needs of our business travelers. The room showcases an elegant and inspired décor with contemporary accent which brings you a pure relaxation week-end break from work stress. Rooms are designed with Sapa architecture, which is cool in summer and warm in winter. These rooms offer views of the Fansipan mount, terraced fields and Muong Hoa valley. Restaurant: Big restaurant on 1st floor, facing the valley,can accommodate up to 200 pax. Asian & European cuisines are available. Transportation from lao Cai train station to the hotel and back to lao Cai – 24 hours front desk & 24 hours security team at the hotel’s entries . Free internet service and Wi-Fi access in the lobby and restaurant area – Administrative assistance and flight/train reconfirmation and booking services – Express or regular Laundry service and free shoes cleaning service . The page about Sapa View is edited by Sapa Travel Team and we will try to update it. If you have any comments regarding the hotel, contact our editor.